High Mercenaries is a 'casual' World of Warcraft guild for adults (18+). The guild was formed in 2009 on the Nagrand-EU server. (Now Nagrand, Kilrogg & Runetotem). The guild has evolved along with the game and has been home to many raid teams over the years. guild perks and the social aspects of the game, such as group scenarios' and traiding. The guild's aim is to help people to progress through the latest end game content. 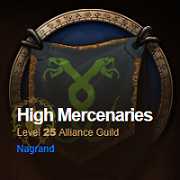 If you would like to join High Mercenaries guild, contact one of our members within the game for an invite. The guild has a Discord voice server for voice communications. The forum and the voice server are for guild members and friends only. People who are not guild members will be removed/kicked/banned, without warning. to find out who they are. There is a link to the guild roster in the navigation bar of this page.